Finally … Google has added a thumbnail view to its Google Docs. For visual people, this is a nice way to “see” your files, particularly now that you can upload and share any kind of file now. 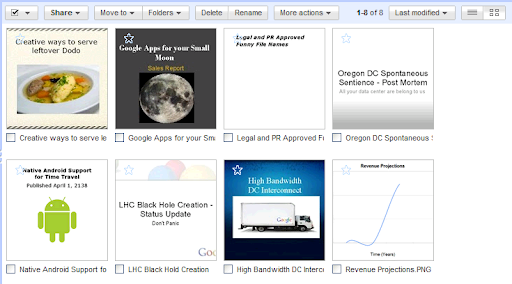 In the upper right corner of your Google Docs dashboard, just click the icon for thumbnail view. This entry was posted in Technology Resources and tagged google. Bookmark the permalink. I’m a visual person and can appreciate this feature. What can we use to do the same thing with webpages? Anyone have suggestions?